Since my business taxes are paid with my personal taxes, what's the best way to pay my business taxes? Which checking account do I use to pay my business taxes? What about paying estimated taxes? How do I pay for tax preparation for business and personal taxes? What about paying for self-employment taxes? First, let's look at the question of which account to use to pay business taxes at the time you file your business and personal tax return. Most small businesses file Schedule C for business taxes and Schedule C is part of your personal tax return filing. You always want to separate out business from personal expenses. Business expenses are deductible in most cases, but personal expenses usually aren't (or deductions are limited). So, your CPA gives you one bill for tax return preparation - for your personal taxes and Schedule C for your business taxes. 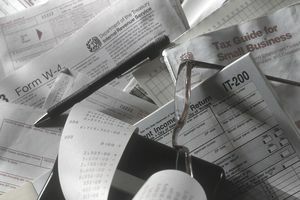 Paying for tax preparation can be divided easily between Schedule C and the personal tax return. Ask your tax preparer to divide your bill into two parts - one part for preparation of Schedule C and one part for preparation of your Form 1040. Then pay the Schedule C preparation bill with your business checking account and the bill for your personal tax return with a personal check. You must pay your taxes on your business mixed up with personal taxes and self-employment taxes (which are essentially a business tax bill). But remember that income taxes are considered a personal expense, not a business expense. Knowing how much tax you must pay on your business income doesn't make a difference. The same is true for self-employment taxes (Social Security and Medicare). These taxes are considered a personal expense, not a business expense. If you commonly don't have to pay estimated taxes personally, because you have withheld enough from other income, and your business will show a profit this year, then you might want to pay your business taxes from your business checking account. Using your business checking account to pay estimated taxes for business profits leaves fewer questions for the IRS. Which account to use to pay estimated business taxes might also be determined by your business type. For a sole proprietorship, it may not matter which checking account you use, but you don't want the IRS to question the separation of business and personal expenses. For LLC's and partnerships, use the business checking account unless you typically pay estimated taxes on your personal taxes. Check with your tax advisor before writing a check to pay your estimated taxes. If you don't have a separate checking account for your business, you should seriously consider getting one. Read this article about why you should have separate business and personal checking accounts, then get that business account set up. Other options for filing your business taxes with the IRS include e-filing, through the IRS e-file and pay system. If you have a tax preparer do your taxes, you can file through your tax preparer, who can also help you separate out business and personal tax payments. You can also use tax preparation software to prepare your combined business and personal taxes, but you won't get any help figuring out how to separate the business from the personal tax payments.